Finian's Rainbw. Sure, there's no pot of gold at the end of it, but a beautiful new world under it.—Finian McLonergan, who journeys from Gloca Mora to America in hopes that burying a pot of gold he's "borrowed" from the leprechaun Og will magically turn into a golden harvest if buried in the hills surrounding Fort Knox. It's a sure thing that Finian McLonergan's pot of gold isn't going to magically yield a fortune to insure his daughter Sharon's future. In fact, he never makes it to Fort Knox, but instead ends up in a Rainbow Valley, Missitucky, home to a group of struggling sharecroppers and guitar-toting Woody Mahoney who is trying to prevent from being taken over by the corrupt and racist Senator Rawkins and his self-serving sycophants. The McLonergan's arrival provides the necessary bailout. It's just as sure a thing that the various and somewhat convoluted plot lines will lead to a happy ending for all involved. What's more, this more fully staged, freshly adapted and slightly re-cast Broadway version of last year's Encores! production adds up to a musical pot of gold. This family friendly, unashamedly feel good show with one hummable song on top of another, eye-popping choreography (a Celtic infused nod to origial choreographer Michael Kidd) and a book that mixes Irish blarney, hokey charm and political satire that's surprisingly timely, the sixty-two year old Finian's Rainbow remains remarkably young and enjoyable. Oh, and did I mention that it's got a good-sized cast (more than 30) and orchestra (2 dozen strong) and that the sound of Burton Lanes lovely score is well modulated and rich but never wildly over-amplified? For lyricist Yip Harburg, Finian's Rainbow was a chance to give World War 2 weary audiences an escapist fairy tale and serve his strong social conscious by pioneering multicultural casting and satirizing the blatant racism of the likes of Senator Rawkins. Nowadays Harburg's forward looking social concerns tend to be unpalatable in our rainbow colored society. Luckily, adapter Arthur Perlman, a Harburg scholar came up with a clever way to deal with the wish come true that turns the nasty Rawkins' skin black (you see, Finian's pot of gold has the magical power to grant three wishes made while standing on the spot where it's buried and that wish to teach the Senator a lesson in empathy is inadvertently made by Kate). Instead of having the actor playing Rawkins fall down and rise in black face (a device made offensive during the Civil Rights movement), we now have Rawkins played by two actors, one white and one black. Another problematic scene in which racist Buzz Collins tells Howard a black servant to shuffle when he serves the Senator a drink is given a fresh satiric twist by making Buzz a silly boor and Howard a college student who sarcastically and hilariously overdoes the order. The plot complications revolve around the share croppers' financial problems, the discovery that there's gold on their land, Kate and Woody's romance and, of course, those unintentional wishes that fulfille the magic pot's golden promise — including one by a fanciful leprechaun who has pursued Finian to America to retrieve the "borrowed" pot. Magic wishes, a romantic leprechaun, and a proscenium primed to turn into a rainbow to as one of the many of the show's standards everyone can hopefully " look, look, look to. . ."
Even if you're not big on whimsical fairy tales and impish Irishmen and leprechauns, the music is solid gold and the satire has more or less updated itself. While anyone who grabbed at the dream of the good life through easy credit isnt likely to be experiencing a Finian-like happy ending, it's nice to see it all work out onstage. As for Finian's and the sharecroppers' confrontation with representatives from Shears and Roebuck, while no longer a putdown of big entrepreneurs like Sears-Robuck has found a new target in our Wall Street establishment that draws wry laughter from the audience. (Finian's question as to what S & R would do with the gold they want him to dig up and turn over to them, draws a response of "Send it to our bank in Chicago." When Finian wants to know what the banks would do with it, he's told "Transfer it to a bank on Wall Street."). Mr. Carlyle has added a sly twist to the first act's scene 5 which has the sharecroppers bring in some fresh picked tobacco leaves and sorting them. He has the group respond with coughs to one sharecropper's description of Grade C as a "cooler, milder, better smoke." That leaves it to "Necessity,"" which follows, to explain the irony of these farmers' sustaining themselves by growing a harmful product: "What throws the monkey wrench in/ A fellow's good intention,/That nasty old invention./Necessity" And so the Lord who says,"go out and have fun" is trumped by the "Landlord" who says "Your rent ain't paid." Fortunately Jim Norton, Kate Baldwin and Cheyenne Jackson are back to reprise their Encores! roles. Norton, best known as a character actor, is better than ever as Finian. His singing though only occasional is just fine, and he does a mean jig. Best of all, he brings a warmth and depth to a role that could easily be a two-dimensional caricature. Baldwin's clear sopranois as gorgeous as her looks. It's a wonder tht she's not played starring roles before. The tall, dark and handsome Jackson fits what when Finian began its 1947 run was still referred to as "matinee idol looks." 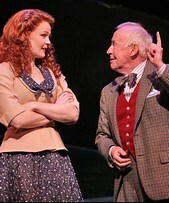 A seasoned musical actor, he makes the most of his first opportunity to star in a classic musical like this. Kate and Woody's falling in love ballad, "Old Devil Moon," will devilishly replay itself in your ears long after you leave the theater. Other welcome returnees include ballet dancer Alina Faye, and Terri White. Faye is Woody's sister Susan who can only talk with her feet -- and oh do those feet talk! Thanks to the wise decision to move the orchestra from its traditional Encores! position on stage into the St. James Theater's pit, Faye's dancing (especially when accompanied by harmonica playing Sunny (Guy Davis,another holdover from Encores!) has been given more room to dazzle. White as Rainbow's Mayor Dottie is sure to keep stopping the show as she leads the women and Sunny with her big-mama singing of the rousing "Necessity." The show has gained several invaluable new cast members: David Shramm as the racist Rawkins and Chuck Cooper as his black alter-ego are superb. Christopher Fitzgerald is perfection as Og, the leprechaun whose pants grow shorter along with his diminishing leprechaunish powers. His singing of the comical "Something Sort of Grandish," a song for which Harburg zestfully indulged his penchant for coining. words is quite splendish. John Lee Beatty's set design is no doubt more "grandish" than it was at City Center but like Scott Lehrer's subtle sound design, it's not overly showy. Unlike Beatty's drop-dead realistic interiors for shows like The Royal Family and Brighton Beach Memoirs, his green grass and trees are, like the story, pleasantly fanciful rather than super realistic. Toni-Leslie James has provided the large cast with a mind-boggling array of colorful, made for dancing costumes and witty support, especially to the spectacular anthem to consumerism, "When the Idle Poor, Become the Idle Rich." David Ives trimmed the original book just enough to bring it in at just two hours plus intermission. Except for that streamlining, this is a chance to see a classic they-don't make-them-like-that-any-more musical with a full orchestra and cast, and for an open run. Will that run rival the original 723 performances? I'd wager a wish of my own that it would surpass it, but given the current economic climate, a really sturdy run can be guaranteed only by a leprechaun with a pot of gold. Cast: Kate Baldwin (Sharon McLonergan), Christopher Fitzgerald (Og), David Schramm (Senator Rawkins), Chuck Cooper (Bill Rawkins), Alina Faye (Susan Mahoney), Cheyenne Jackson (Woody Mahoney), Jim Norton (Finian McLonergan), Brian Reddy (Sheriff), William Youmans (Buzz Collins) , Terry White (Dottie), Guy Davis (Sunny),	Christopher Borger (Henry), Page Simonovich (Diana), Tyrick Wiltez Jones (Howard), Joe Aaron Reid (Black Geologist), Taylor Frey (White Geologist), Steve Schepis (Deputy), James Stoball (Preacher, Second Gospeler), Tim Harman (Mr. Shears), Kevin London (Mr. Robust), Bernard Dotson (First Gospeler), Devin Richards (Third Gospeler). From 10/08/09; opening 10/29/09; on sale through 1/03/10.